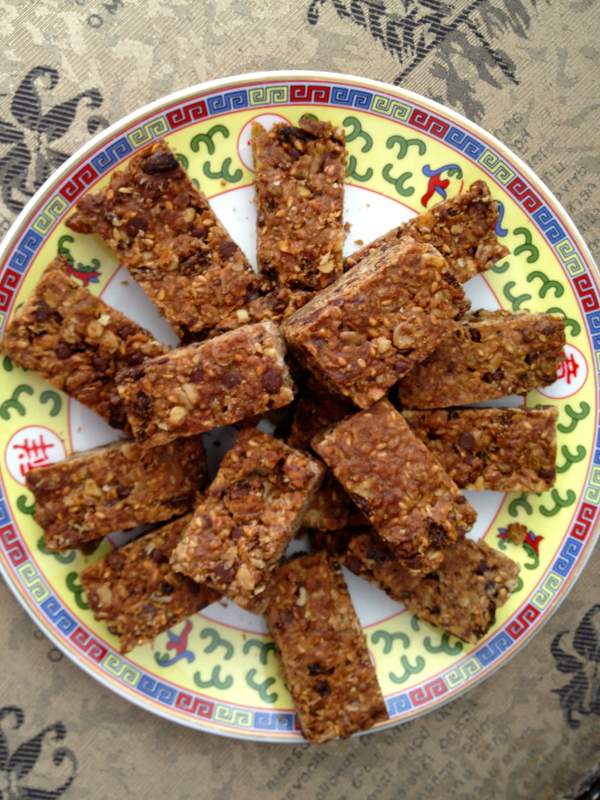 Lots of good and healthy ingredients in these bars and not bad chemicals or unhealthy additives. I may have posted this recipe before but since then I have made improvements to the taste to the original recipe which I found online (forgot where I got it from so sorry to the original poster). In addition, I have found the way to cut them so beautifully. I have yet got a way to cut them all equally but there must be some gadget out there for making them all the same size! And I must write that blog post/article about the many uses for my new best friend, parchment paper! Preheat the oven to 350 degrees F (175 degrees C). Generously grease a 9×13 inch baking pan. Better still, line the pan with parchment paper, it’s my new best friend! In a large bowl, mix together the oats, brown sugar, wheat germ, sunflower seeds, flax seeds, cinnamon, flour, walnuts, raisins, chocolate bits and salt. Make a well in the center, and pour in the honey, egg, oil and vanilla. Mix well. Pat the mixture evenly and press down well with a spatula into the prepared pan. Bake for 30 to 35 minutes in the preheated oven, until the bars begin to turn golden at the edges. Do not over bake. Cool for 5 minutes and remove from the pan with the paper and all. Let cool completely then cut into bars with your best cleaver. Store in a sealed container. Moist and yummy the next day. Prepare the crust by mixing together the softened butter, flour and sugar with a pastry cutter, hand mixer or a fork. Press the mixture onto the bottom of a parchment paper lined baking pan. Bake in a preheated oven at 350 degrees F (175 degrees C) for 20 minutes, or until golden brown. Beat together the ingredients for the filling. Bake for 20 minutes. 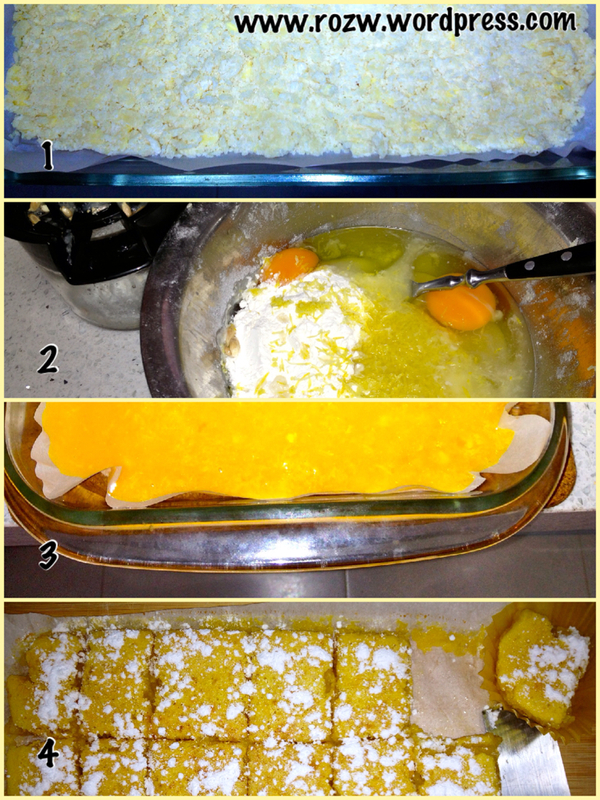 The lemon filling may not be solid but will firm up as it cools. Carefully remove from the pan onto a cutting board together with the paper while still hot. Sprinkle with powdered icing sugar. Cut into squares when cool with a sharp knife dipped in cool water each time you make a slice and place in muffin papers.